Promote EasySendy Drip and earn 15% of every sale! When you become an affiliate, we’ll provide you with a special affiliate link. You can put the affiliate link on your website or social networks and refer businesses in need of email marketing software to EasySendy Drip. When a new user visits, and signs up at EasySendy Drip via your affiliate link our system instantly identifies that they’ve come from you. When a purchase is made by your referral you will automatically receive commission! Why join the EasySendy Drip affiliate program? When a user that you refer buys a subscription or purchases email credits, you’ll receive 15% commission on all of their purchases for 18 months since the creation of their account. Thanks to its rich features, user-friendliness and great prices, EasySendy Drip has quickly become a leading marketing platform. We use integrated application for tracking, one of the most reliable tracking solutions, which allows you to monitor your commissions in real-time. Cookie duration is 90 days. When someone you refer to us orders an account, you’ll earn 15% not only on the initial sale, but also on any recurring payments they make. Your commissions will be reimbursed after you reach $100. Payments are processed through PayPal or bank transfer (Only in India). 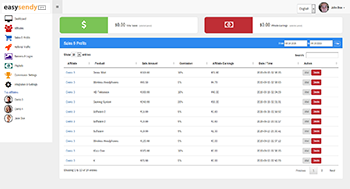 We’ll provide you with a special Affiliate Dashboard where you can monitor your referral’s signups, purchases and the subsequent payments to you. You’ll also receive the marketing materials you will need to successfully sell EasySendy Drip. Who can join EasySendy Drip Affiliate Program? Help your customers enjoy a simple and powerful hybrid marketing solution and earn 15% of their purchases. Introduce EasySendy Drip to your visitors and earn commissions on their orders. Get paid when you share EasySendy Drip with friends and colleagues. How You Can Promote EasySendy Drip? Share EasySendy Drip with your email list. We’ll even help you write the email in order to maximize conversions! Add EasySendy Drip to your Resources page on your blog as your recommended graphic design tool. Write a full review on EasySendy Drip and publish it on your blog. Write a EasySendy Drip vs ________ (whatever tool you are most familiar with or personally switched from) post. Talk about EasySendy Drip on your podcast (or interview our CEO Christopher) and include your affiliate link in the show notes. Create video tutorials on how to use EasySendy Drip to create awesome images. Promote EasySendy Drip on your social media channels. We offer a 90 day cookie life. Conversions are tracked through your affiliate link provided by our integrated affiliate tracking software. Payouts are currently made at the beginning of each month when you reach minimum payout value of $100. Can I use my own affiliate link? What are term and conditions for joining as an EasySendy Drip Affiliate? All term and conditions for EasySendy Drip Affiliate Program is mentioned here. Share EasySendy Drip and earn recurring 15% commission!